I’m sure most of you know Marty Friedman as the axe slinger of Megadeth’s “classic” years. All guitarholics out there are probably also aware of his pre-MD days in Cacophony, an über-shred outfit where he shared widdling duties with fellow virtuoso Jason Becker. At least that was how I knew him years ago when I came across Scenes at a hometown used-books-n-records store. “Friedman solo album for five euros, cool!” I had heard his shredtastic solo debut, Dragon’s Kiss at a friend’s place and was thinking that this disc would contain similar virtuosity. This is virtuosity alright, but not the kind that I expected. The windy keyboards and bell chimes that open Tibet was far, far from what I expected. Today fans of Friedman are well aware of the devoted Japanophile the man has become with his involvement in J-rock and -pop bands, national TV shows in Japan, etc. but based on Scenes, around 1992 was when Marty was really starting to get into the orient. The base of the album is a very atmospheric, almost new agey pop sheen where oodles of lush keyboards and acoustic guitars weave melodies en masse. Friedman liked his exotic scales in his metal solos and the oriental influence is very apparent in here as well. Realm Of The Senses even spells it out for you with the only spoken words found on the album, as mid song some soothing words in Japanese rise up behind the soundscape. I have no idea what they mean but they fit the song really well. Close your eyes while listening through these tunes and you can easily imagine the rising sun, blossoming cherry trees, platefuls of sushi…sheesh, am I getting sappy or what? But seriously, without waxing poetic, this is beautiful music. Those wishing for at least a little bit o’ widdlin’ don’t panic, because Marty smokes the fretboard sparingly yet deliciously on gems like Angel, Valley Of Eternity (feel the burrrn!) and Night. Trance, funnily enough the shortest song here at only 1:56 despite being closest to what we'd expect from the man, is all distorted chugging with some tasty soloing on top. The overall scarcity of the solos only emphasises them when they appear and force out your mightiest air guitar. Of course, if you count the “lyrical” lead melodies that soar on top of the keyboards more often, there’s a good amount of soloing going on, not just the over-the-top-shred-master kind. Even though all the compositions here are by Friedman, half of the songs were produced by Japanese multi-instrumentalist Kitaro, whose presence could’ve easily driven Marty even further to the experimental direction displayed on this album. Never-heard-of-him Brian BecVar handles the keys and percussion while ‘Deth-buddy Nick Menza provides the steady backbeat on skins for Friedman to show his mad skills. Scenes is seriously one of the biggest surprises I’ve ever purchased, and I can’t emphasise enough how pleasant that surprise was. 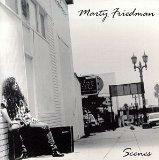 Whenever I need some relaxing listening that’ll take my thoughts somewhere way far away, Scenes is my go-to album. If you want to hear Friedman doing some non-stop shredding, go for his material with Cacophony or the aformentioned Dragon’s Kiss. If you want to hear a guy you probably consider a superb guitarist but little else pull of something artistically different yet awesome, go for Scenes.